Long time Sleaze Roxx readers may remember Kim Hogberg as the frontman who played on Wolfchild’s stellar self-titled debut, which reached both the Sleaze Roxx Top 10 and Readers’ Top 20 in 2006. Hogberg has incorporated many musical elements from his Wolfchild days into his current project called Electric Black, whose music is described as, “not forced to sound like something that was done in the ’70s or ’80s — this is the real deal!” Having played in Finland based bands for more than a decade, Hogberg is a prime example of someone following his passion no matter what the odds and obstacles are — while staying true to his own vision. Sleaze Roxx caught up with Hogberg to discuss everything from his departure from, and the later demise of, Wolfchild to his new project Electric Black. Sleaze Roxx: On an international basis, you are likely best known as the ex singer of Wolfchild. What were the reasons for your departure from Wolfchild about six or seven months after the release of the band’s first album? Kim Hogberg: It was a situation where I was heading in another direction, simply doing hard rock music, but I wanted a different kind of harmony for the music and maybe a little bit more — how do you say that — if you really concentrate more on what you are wearing on stage, in pictures and so on. Actually, I replaced two men in Wolfchild when I joined. They had a band called Nasty and their ex singer moved to another city and they didn’t have a singer and I was available at the time. So they had a guitarist and they had a singer and I replaced both of them (laughs), because I play guitar also. Sleaze Roxx: So you wanted to have a more image focused band and the rest of the guys did not, is that it? Kim Hogberg: Yes kind of, but that is not the whole point really. I wanted so many things to be in different way. I wanted to follow my own vision. Sleaze Roxx: I understand that you are about to release an EP called ‘Charge’ under the band name Electric Black. When did you form the band and what is the current status of the band? 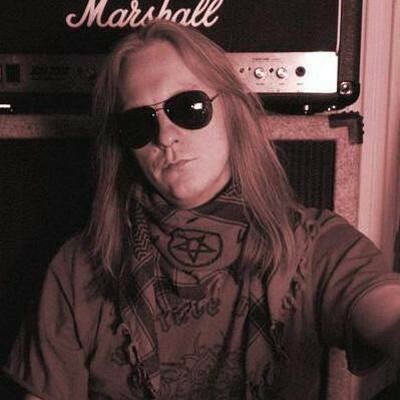 Kim Hogberg: The current status of the band is, now I can say, idle. But after I mix this record and the one guitar solo — one guitar solo is missing from the record — after I release that album by myself, I will send it to many places like record companies, Sleaze Roxx of course and you of course. Then I am going to search for band members to form the band again. Maybe I’ll put out an ad or maybe this interview will have to be it (laughs). Sleaze Roxx: (Laughs) Your FaceBook page for Electric Black seems to indicate that you put the band on hold about a year ago but now you seem to have things back on track. What happened about a year ago? Kim Hogberg: What happened? It was a pretty difficult time. Let’s talk when we decided, with Otto Luotonen, that we would record. We rehearsed about five songs — maybe four or five songs in the studio — and recorded drums but Otto was so busy with other stuff. We had less than a month to rehearse those songs. Two of them were older but one song which I wanted to be on this record, I am not releasing — I am not releasing that song because the drum tracks are not what I hear in my head. So to me, it was that Otto did not have time to be in this band 100%. Then there was another situation where I had a rehearsal place where I started to record tracks. Some of these tracks were recorded in 2011. For two tracks, the vocals were recorded a short while back. It was the kind of thing that I started doing this record in 2011 but there was this situation where I wanted to record vocal tracks for the album and there was another band behind the wall playing their own material so I could not record. Two bands which were also paying rent for this rehearsal place — I was head of that rehearsal place and I paid the rent and also made other people pay rent — did not understand that they should pay the rent on the same day of the month every month and not like the 15th of the month or so. Other things happened too. I was so fed up that I started drinking heavily (laughs). Yes — it was too much for me and I thought ‘let’s forget about everything for a moment and let’s just drink’. Sleaze Roxx: (Laughs) Fair enough. Kim Hogberg: But this summer I started to get enough courage to proceed doing the record. From the autumn of 2013, I started doing tracks at a studio when my sister’s husband wanted to help me financially. I could now book a studio and do vocals there instead of at a rehearsal place where somebody plays their own material behind the walls. 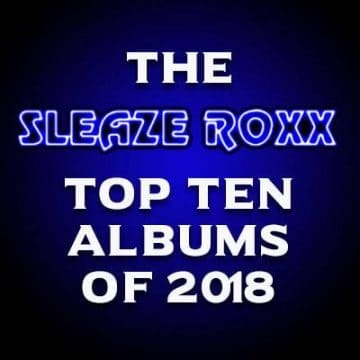 Sleaze Roxx: The songs that I have heard from Electric Black have an old-school ’70s or ’80s feel to them and they are sort of similar to the songs that you had with Wolfchild. What are your thoughts in that regard? 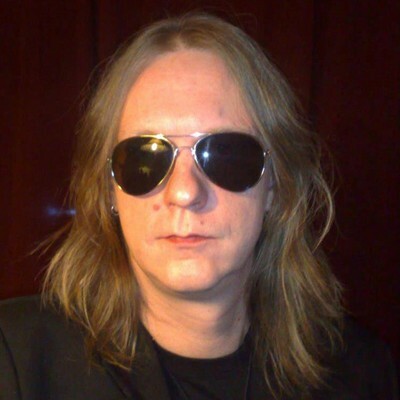 Kim Hogberg: Somebody said that the “Black Rain” song has certain elements that Wolfchild’s “Shadow Zone” had, but the fact is I wrote both of those songs — Jaska Koivusilta did the lyrics. Do you remember that song, “Shadow Zone”? 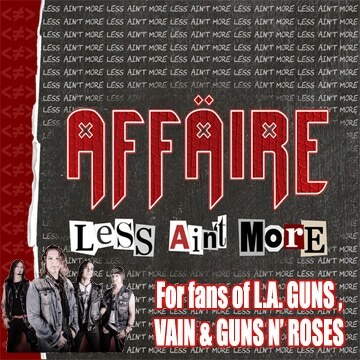 Sleaze Roxx: Yes I do — great song! Kim Hogberg: Yes, it was Jaska’s and my song. My song and Jaska’s lyrics — the guitars go in a quite similar way in some part of the song with a picking style. Sleaze Roxx: Who is playing on your new EP that is going to come out? Is it just you and Otto Luotonen? Kim Hogberg: Otto plays drums on all the tracks on the record. He is not in the band anymore but we are still friends — he is a cool guy. I play guitars, bass and vocals — all of them — everything except the drums. And maybe one guy will be doing some keyboards on the album, I am still waiting for him to come to my house and record some tracks. 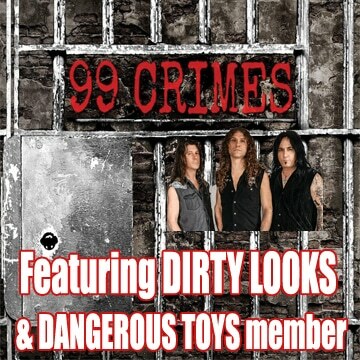 Sleaze Roxx: Do you have a target date when the record will be released? Kim Hogberg: I hope within a few months because I am still waiting for the keyboard player to do his parts and I have to record one guitar solo. Actually, I do not know how I am going to do it because my amplifier is now at my cover band’s training place so maybe I have to take it home and disturb the neighbors again. Sleaze Roxx: (Laughs) You have a very distinctive voice and I really like it. How did you get into singing in the first place? Kim Hogberg: I remember singing when I was 10 years old. I had an acoustic guitar and I played the song “Tom Dooley” in front of my class. You know the song “Tom Dooley”? It is a really great story because Tom Dooley was hanged — he was some kind of criminal — and I was 10 years old and doing that song at school (laughs). But that was not when I started singing, I started singing when I was 15 years old. We had this kind of Metallica meets Stone — that is a Finnish band — kind of thrash metal thing going on. The other guitar player sang also but he had such a terrible voice that we thought that I would do better and that was the start! I started singing when I was 15. Sleaze Roxx: You have actually been playing and recording in Finland for a long time. You have played in a number of bands including Wolfchild, Bulldozer and Helion. What I noticed is that those last two bands had a very different musical style. Can you take me through your evolution in terms of music and styles of music that you have played? Kim Hogberg: From what age? Sleaze Roxx: Well, let’s say — I think Bulldozer was your first band, right — where you recorded anything? Kim Hogberg: We did record a few — one was a demo cassette. It had four songs on it. On the internet, there are some Bulldozer songs — “Love / Hate”, “Businessman” and maybe a few more songs. one more song. We did record this demo ‘Love / Hate’ in 2000 and after that the band broke up. A few years after that, I joined Helion. I was pretty frustrated because I lived in a little city called Toijala near Tampere. I was working at a computer help desk and at the time I was so frustrated that I wanted to join almost any band. Then I started thinking that maybe I should start a band with my own vision. I went to mussikoiden.net, I put out an ad, and I started searching for musicians through the internet in Finland. 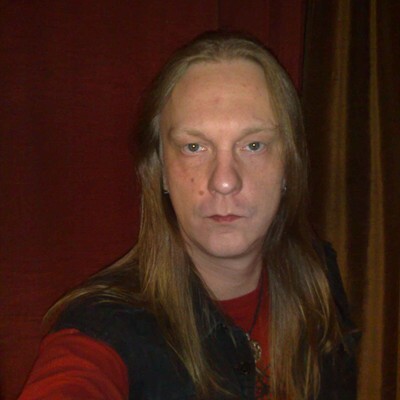 Jaakko Kunnas, Helion’s guitarist and songwriter, contacted me. I also liked singers like Bruce Dickinson and Dio — and there is also Marco Hietala of Tarot which I like very much. At that time, I thought I would sing in the same style as them. It was kind of a difficult situation where I was playing in Helion and Wolfchild at the same time. I actually had to sing school English in Helion and American English in Wolfchild — so it was kind of a schizophrenic thing when you have to train your school English to American English. It was hard. I did a few records with Helion but I was not happy after all. At first, I was. I was so much different from the other guys because they had education from music schools and stuff like that while I am kind of a self-made man. I have learned a few things about music theory by myself but I had not gone to any music schools — with the exception of two years when I was a kid when I was trained in piano at a music school, but that was all. They did lots of stuff after I quit and it was really a shame that they worked so hard and never got much attention from the business. We also had rehearsals on Sundays and people in Finland drink on Saturday and they have a terrible hangover on Sunday (laughs). With later bands that I played with, I said to the guys, “I don’t want to rehearse on Sundays — never!” Once, a few weeks back from this interview, we went to rehearse on a Sunday with my cover band named HARD HITS. The bass player had a hangover and I think the guitar player was still drunk and I was too. So that is why you do not rehearse on Sundays. So Helion rehearsed only on Sundays and maybe that was one reason why I quit that band (laughs). No really, no, no — it was not that, but part of it might have been. After Helion and Wolfhild, I started to think I never want to rehearse on Sundays. Sleaze Roxx: Within a year of you leaving Wolfchild, the band’s bassist Jaska Koivusilta suddenly died. Do you know what the cause of his death was? Kim Hogberg: (Sigh) I really don’t want to talk about it no more. I would like to think that he was sick for a long time and that took him away. Sleaze Roxx: Okay. Well, what are you best memories of Jaska? Kim Hogberg: (Laughs) He was kind of a funny guy — he was always cracking jokes. One that comes into mind — we weren’t actually playing — we were not rehearsing at the time with Wolfchild. Maybe it was Jaska’s wedding? Before a wedding, the men get together and drink and stuff. What is it called? Sleaze Roxx: A bachelor party? Sleaze Roxx: (Laughs) That is pretty funny! Kim Hogberg: That’s really a true story (laughs). He had a routine at gigs when we would play AC/DC or something. This is only at the start of the song. There is an open A string — “dun dun dun”. He played that and he drank a long drink at the same time with another hand. That was his routine at the gigs. Sleaze Roxx: That is funny. I noticed that after Jaska died Wolfchild played a tribute concert for him where you actually joined the rest of the band members to play a few songs. How did it feel playing that show with the ex and current Wolfchild members? Kim Hogberg: It was cool. We played a few times. What was important to me at that gig was we played Jaska’s newest song. He wrote that song before he died, maybe a half year or a year prior. We recorded that song and it is on YouTube also — it is called “Thunder Road”. It is Jaska’s song. He went to a music store and played acoustic guitar and made that song at the store and he said that he thought that I am going to buy this guitar (laughs). He wrote that song at the music store and then bought that guitar (laughs). And that is a really cool song. The thing with Wolfchild was I think the other guys’ motivation was used up at the moment because they only did a few gigs after my departure, or after I quit. They did a few shows but then they kind of forgot the whole band. The last time that I spoke with Marko Purosto, he said that the band had not been around for many years. It was the end after Jaska died. Sleaze Roxx: What are your favorite songs that you have written and why? Kim Hogberg: Let me think about this for a moment. I have a list on my computer with all the songs. Hmmm. I have to say one of my new songs is kind of important to me and cool at the moment — it’s called “Rip It Off Over The Bone”. It is still only in my head and I have not made a demo of it yet. It is the story about my life. I have been in situations where I did not have a lot of money but all the money that I did have, I put it into buying amplifiers and music related stuff. For example, I would spend 200 Euros on stuff and then wonder how I was going to eat for the rest of the month? But that song is not going to be on the record so I should maybe say another song. “Unlucky Star” is maybe one of our best songs that is going to be on the record. I think it is a cool song because it is catchy and it rhymes all the way I think. It is the kind of song where I tell the listeners that everybody has a rough time in their life at some point and some have even more than others. This song is about not giving up and believing in yourself: “Where do you stand with a broken heart? Who can you trust when you are torn apart? Staring upon an unlucky star.” It is kind of an encouraging song. That is how I thought when I wrote it. Sleaze Roxx: Last question for you. What are your three favorite albums of all time and why? Kim Hogberg: Okay. At first I have to say number one at the moment is W.A.S.P.’s self-titled debut (laughs). I like the lyrics and they are so far out with dancing with the devil and all that stuff. And also the guitars and the songs — the whole thing — that is my number one record. Ooohhhh, this is so difficult, there are so many good records — let’s see. Then I like Badlands’ second album ‘Voodoo Highway’. There is a song called “The Last Time”, which they made a video for — that is my all-time favorite. Another song is “Silver Horses”. I have a ring tone on my phone which starts with Jake E. Lee’s playing. I very much like Jake E. Lee’s playing. It is great that he is doing music again — that is cool. Sleaze Roxx: That is true. One more album. Kim Hogberg: One more record. It is difficult to choose my three favorite records. I should go to my home and look at these records and see what my favorite ones are. Sleaze Roxx: Whichever one comes to your mind. Kim Hogberg: Well maybe since this is not so serious, I have to say Tarot’s ‘Crows Fly Black’. That is an important record to me. It is so heavy and so intense. I have not listened to this album for quite a while. Nowadays, I don’t want to listen to much depressing music — that does not suit me at all. 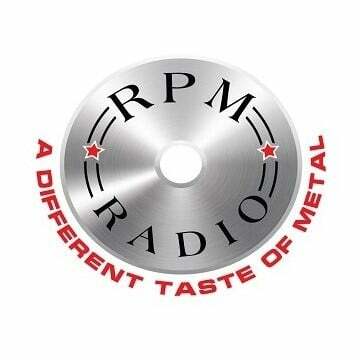 Sleaze Roxx: Thank you very much for doing the interview Kim. 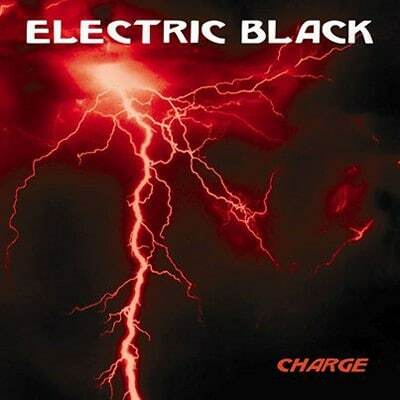 I really look forward to hearing your Electric Black EP when it comes out!